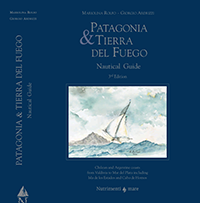 This pilot, now in its 3rd edition, is published in English by an Italian couple who have spent more than eleven years cruising in the Patagonia and Tierra del Fuego area. The work is divided into two sections. The first part contains subjects such as yacht preparation, rules of navigation, meteorology, radio frequencies, flora and fauna, geology, history and a bibliography. The second part is strictly nautical. It describes more than 400 anchorages, all tested out by the authors. The description of every anchorage is accompanied by a clear plan, with recommendations as to where best to anchor as well as other practical tips. Principally in black and white but with some magnificent colour plates.